H. 30, W. 31, D. 12 in. 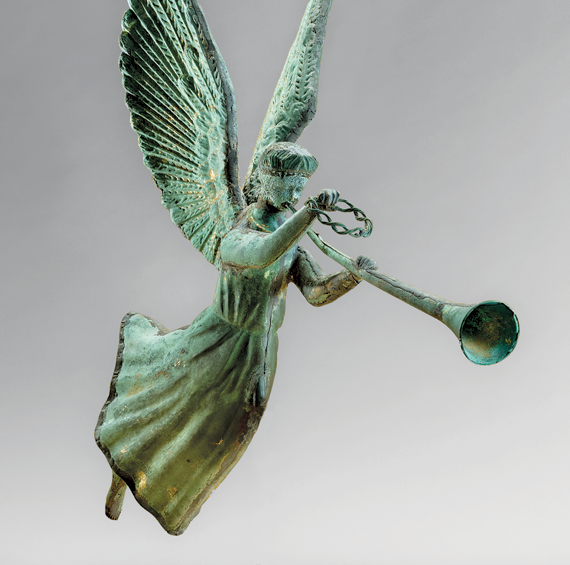 The Greek allegorical figure of Fame, trumpeting a triumph and bestowing a laurel wreath, was a rare subject for commercial weathervane manufacturers of the late nineteenth century. The delicate figure was undoubtedly difficult to execute and had only a limited number of appropriate architectural settings. This weathervane is said to have been found on a building in the Boston area that was possibly used as a Catholic preparatory school for girls. It is one of only five known weathervanes featuring Fame, and the only one depicted in a flying pose. Its maker is unknown, although it was probably the product of either E. G. Washburne & Co., J. L. Mott Iron Works, or J. W. Fiske, all major shops in New York. Attribution of these weathervanes is made difficult by the standard practice of borrowing designs or buying and reusing parts. For more than thirty years, Jane Katcher, a retired pediatric radiologist, has been collecting American folk art and Americana. Her collecting interests are expansive and include painted furniture, Shaker objects, theorem paintings, Academy and school work, trade signs, weathervanes, portraits, and more. The Katcher collection became widely known in 2006 with the publication of Expressions of Innocence and Eloquence: Selections from the Jane Katcher Collection of Americana.1 This autumn she will publish a second volume of her growing collection, which will include a stunning array of folk masterpieces. To coincide with the new publication, the Fenimore Art Museum is presenting Inspired Traditions: Selections from the Jane Katcher Collection of Americana along with an accompanying symposium. This article features some of the highlights of Jane Katcher’s new volume and a selection of material that will be featured in the exhibition. The Katcher Collection builds on the field of American folk art that was shaped by collections at institutions such as the Fenimore Art Museum, American Folk Art Museum, and the Abby Aldrich Folk Art Museum, among others. Such collections continue to redefine our thinking about American art, and provide remarkable insight into the lives and times of a wide spectrum of Americans. 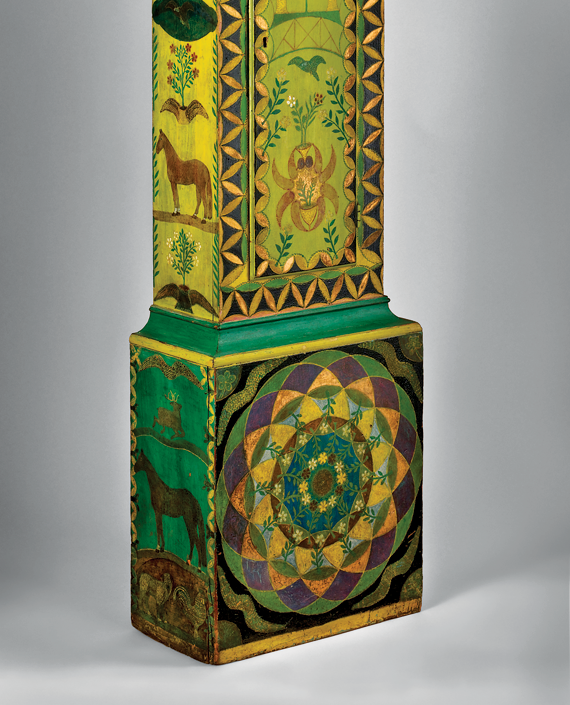 The artworks assembled by Jane Katcher over the course of three decades expand the profound connection between folk art and American history, and the folk artist’s full expression of beauty in both form and ornamentation. Many of the key artworks presented in Inspired Traditions tell compelling and surprising stories of individuals who lived on the cusp of dramatic changes and upheavals in the early American Republic. The material relays and represents the lives of women living at the outer reaches of European empires vying for supremacy in a new land, men learning to harness the natural resources of this land and create new settlements, traveling artists who used their social skills and business acumen to earn commissions, members of religious societies making useful items for their community, and young women fashioning tokens of affection for friends and family. Their personal choices shaped the course of history in ways rarely appreciated, and the manner in which they chose to be tangibly represented shows us how America chose to depict itself. The cabinet-making trade probably linked the sixteen-year-old Mary Danforth to the subject of this elaborate memorial. Enoch Long, who died at the age of six, hailed from a cabinet-making family like the Danforths. His brother, Rufus W. Long, became Mary’s husband in 1826. This memorial is exceptional for the hierarchical patterning by relative size of the figures, and is unusual for the combination of mediums employed by the young artist. 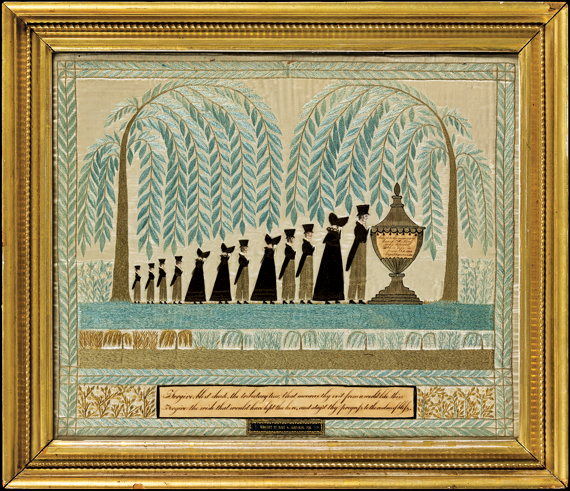 It is not known where Mary learned her skills; her piece differs significantly from the known works in local schools where needlework was taught. This exuberant sign displays its owner’s name and, perhaps, his (highly abstracted) likeness. Morris Lord (1794–1849) inherited a portion of his father’s estate and for a time enjoyed financial success in real estate in and around Parsonfield. By the 1820s he briefly owned a store, presumably the business advertised here. 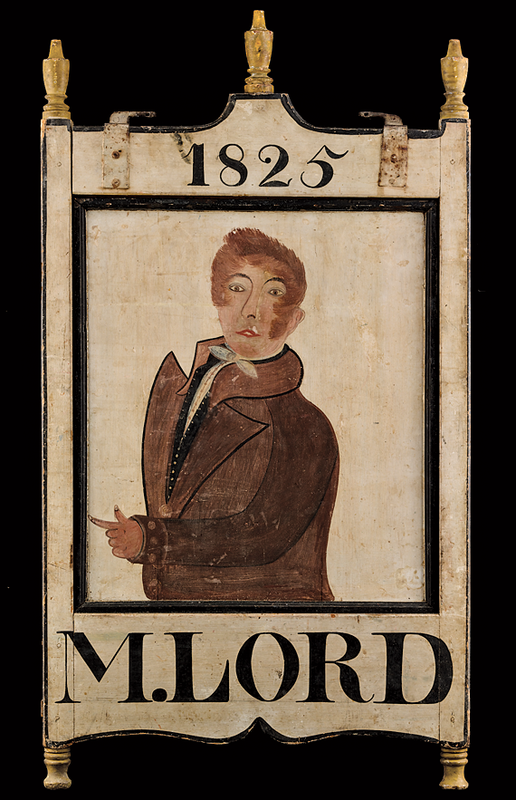 Historical data indicates that Lord lost his store by 1826, after which this sign went into storage and thus survived in good condition. Lord suffered financial losses by 1840, possibly as a result of the Panic of 1837, and moved with his family to Lowell, Massachusetts, where he ran a boarding house, one of many in the thriving mill town needed to house the thousands of young women who worked in the factories. The enterprise must not have succeeded, for Lord’s death certificate indicates that when he died of cholera in 1849 he was a laborer. James Osborne is known for his charming watercolors of family records and historical scenes from the late 1820s and early 1830s. 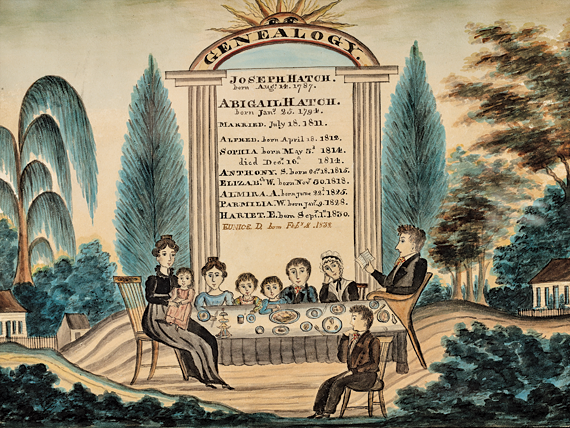 His genealogy of the Hatch family, one of only four known pictorial family records by him, includes a remarkably detailed rendering of the family seated together for a meal. Osborne portrays Joseph Hatch’s daughter, Sophia, who had died in infancy in 1814, as a young woman of eighteen holding her younger sister. Imagining the deceased Sophia in this way, at what would have been her natural age, amply illustrates the persistent (and undoubtedly life-long) sense of loss on the part of her parents. H. 85, W. 17-3/4, D. 9-1/4 in. 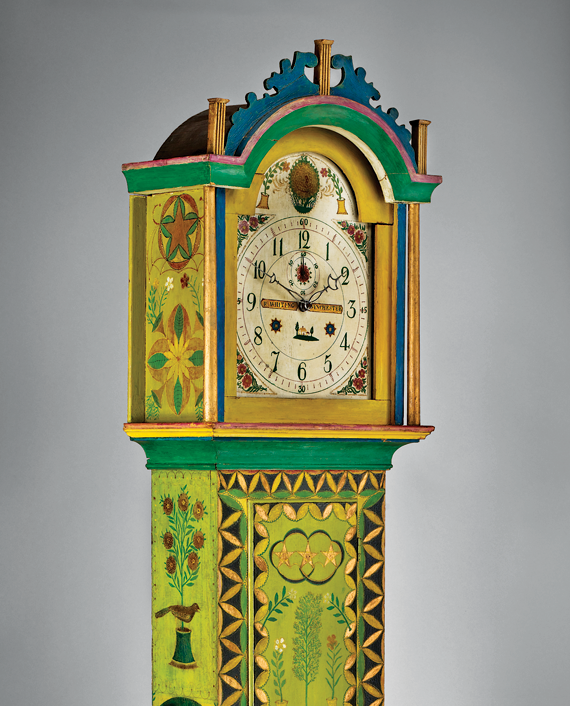 This tall-case clock was originally made around 1830 by an unknown cabinetmaker, and then slightly altered and elaborately decorated by George Lawton Sr. in about 1883. Lawton is also known as the decorator of a group of boxes made as gifts for immediate family members. Though it is not known for whom Lawton decorated this clock, the birth of his great-grandson Hanan Colvin on September 21, 1883, might have provided the occasion. Lawton’s work is known for its rich coloration and precise geometric forms, the latter executed with the aid of a compass. The works for this clock were made by Riley Whiting (1785–1835) of Winchester, Connecticut. H. 12-3/4 in., D. 17-1/2 in. 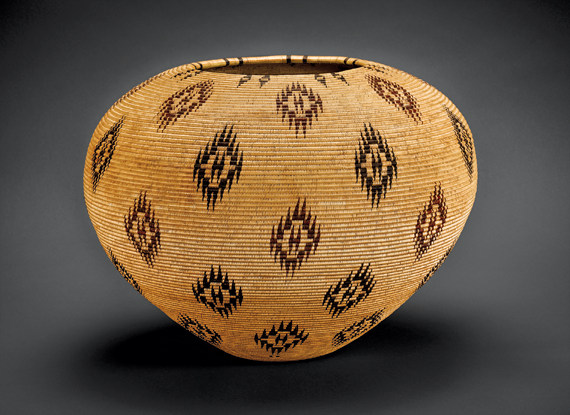 Louisa Keyser, a Washoe woman, is widely considered one of the greatest American Indian basket makers. Her work reached its height of craftsmanship and artistic expression in the early years of the twentieth century under the patronage of Abram and Amy Cohn, whose Emporium Company sold her baskets in Carson City, Nevada. Keyser developed the degikup form, with its tapered base and high shoulders. She typically made her baskets from reeds, roots, and pigments collected from nature, and designed her own abstracted symbols. Ammi Phillips was one of the most successful and prolific portrait painters of the nineteenth century, plying his trade in New York’s Hudson River Valley and western New England for more than half a century. 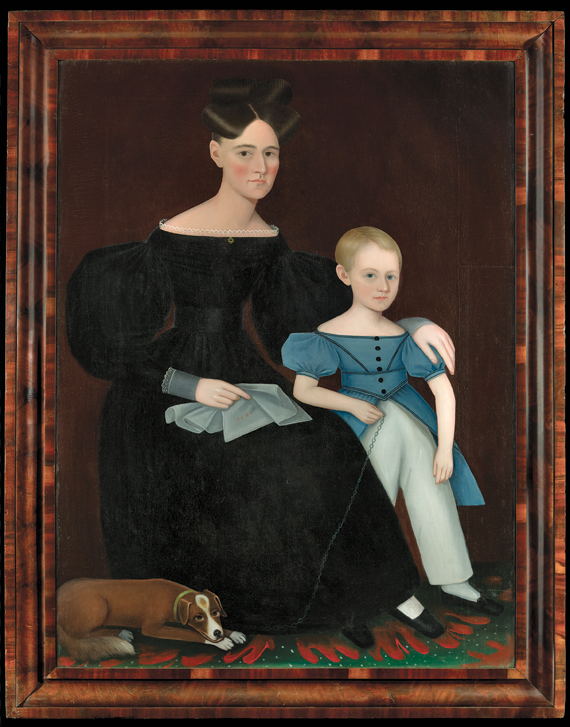 This elegant likeness of Rachel Ostrander and her son Titus is his largest known work and generally considered one of his best. Rachel married Stephen Nottingham in 1827, when she was just seventeen, giving birth to Titus shortly thereafter, and another child just after this portrait was painted. The serenity of the image belies the adversity the principal sitter would face in the decade following the completion of this painting. In 1840, her husband Stephen died. Two years later she married her first cousin, Solomon Overbaugh, who died two years after the birth of their child, Peter. In 1846, Rachel married one final time, to Captain William Swart. 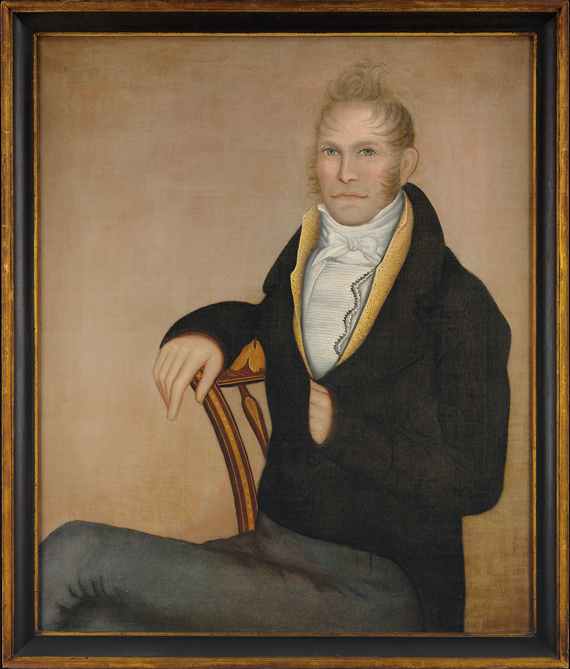 This impressive masterwork of Ammi Phillips’ Border period belongs to a group of eleven portraits of the Dorr family done in 1814 and 1815 in the eastern New York towns of Chatham and Hoosick Falls. Milton Dorr’s father, Joseph, was instrumental in the development of Hoosick Falls into a prosperous industrial village, and was the most prominent businessman in the community. Little is known of Milton’s life other than his marriage in 1812, his four children born between 1813 and 1818, and his premature death at the age of 39 in 1830. A reminiscence of Hoosick Falls written years after Milton’s death recalls him as having “more than an ordinary claim to dramatic talent…His stories and acting, if not calculated to improve the morals of his audience, yet abounded in the humorous and side-splitting properties.” Phillips’ portraits of Milton’s uncle Russell Dorr of Chatham and his family are in the collection of the Abby Aldrich Rockefeller Folk Art Museum, Williamsburg, Virginia. Portraits of his parents are at Historic New England. 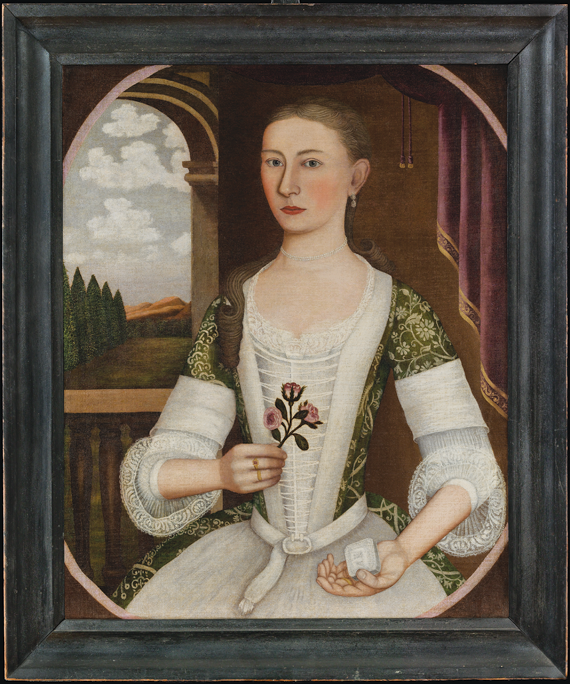 This magnificent Dutch-American portrait of a young woman holding a silver snuff box was previously misidentified by family members and scholars as Anne Brodhead Oliver. Recent conservation work, however, revealed the initials “A. K.” on the snuff box, and new research by scholar Deborah M. Child led to the identification of the sitter as Annetje Kool, who married Matthew Newkirk in the Dutch Reformed Church in Kingston, in 1740. Given the prominence of her wedding ring in this image, it is probably a wedding portrait. The Kool family were early settlers of New Netherlands, arriving in the fledging settlement of New Amsterdam in 1633, and shortly thereafter moving to the Esopus region of the mid-Hudson Valley. Annetje was born in 1713, and had an illegitimate child by the time she was twenty-one. She and Matthew had five children between 1741 and 1758. The attribution of this portrait to Pieter Vanderlyn, also known as the Gansevoort Limner, first made in 1971, was based on stylistic similarities to a group of eighteen portraits noted for their emphasis on pattern and design. It relates most strongly to Young Lady with a Fan (1737, National Gallery of Art, Washington, D.C.). Of the eighteen known painters who worked in the Hudson Valley in the early eighteenth century, Pieter Vanderlyn is one of the most complex and interesting. The range of his experience was broad and diverse, and the smooth, linear outlines of his portraits feel surprisingly modern. H. 3-7/8, W. 7-7/8, D. 4-1/8 in. 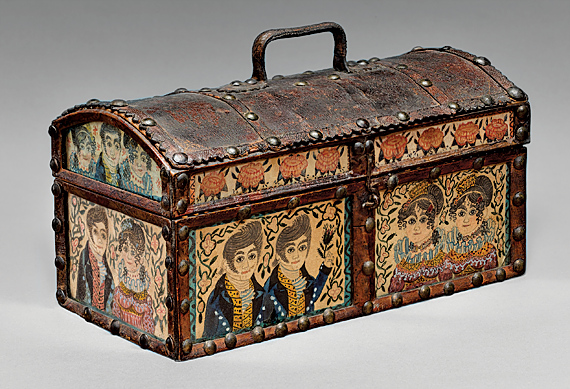 This elaborately decorated box is part of a group of works that include two watercolor paintings and four additional boxes now attributed to Emeline M. Robinson Kelley (1803–1865) and her students. Of this group, this box is distinctive for the quality of the watercolor painting, which includes eight panels featuring eighteen bust-length portraits of men and women surrounded by rose vines. It also has a strong element of fancy to the construction, evidenced by the rows of brass tacks and leather handle. Recent research by Deborah M. Child led to the identification of this school and its instructress, who was born in New Hampshire in 1803 to a prosperous farmer and his Quaker wife. Kelley attended a Quaker school in Maine and began a career as a teacher in the early 1820s in and around Portsmouth. By 1831 she and her sister Abigail had sixty-two pupils. Emeline married the Reverend Samuel Fletcher Kelley in 1830, and appears to have retired from teaching, possibly as early as 1833, to devote herself to her duties as a wife and mother. An inscription on one of the boxes attributed to the Kelley school suggests a possible maker, William Weeks, a fellow schoolteacher in Portsmouth. Washington Benevolent Society traveling desk box, probably Mass., 1812. Pine, original iron hinges, iron lock, brass drawer knobs, molded brass oval pull on top, brass escutcheon, original painted decoration, initialed and dated in red paint “W.B.S.” “1812” and “N.L.,” with an engraving of George Washington under glass. H. 10-1/4, W. 22, D. 10-3/4 in. In the era prior to the availability of specialized manufacture of such items, fraternal organizations often made and decorated their own regalia and associated objects. This box is a rare example of a decorated artifact made for a lodge secretary, to protect important papers (such as a membership roster) from curious outsiders. The box was probably custom-made for a Massachusetts lodge of the Washington Benevolent Society, an organization formed in 1808 to promote Federalist political goals such as a strong national fiscal policy and good relations with Great Britain. Membership was secret, thus the box has no exterior markings, and features a side cover meant to thwart all but the most determined intruder. 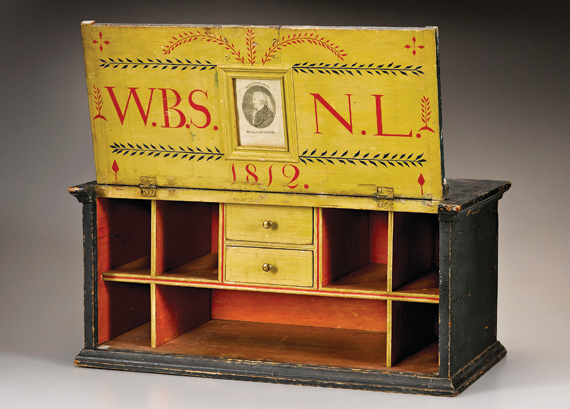 The interior of the box’s cover bears the initials “W.B.S.” for Washington Benevolent Society. The meaning of “N.L.” is undetermined, but provided the inspiration for seminal collector Bertram Little to offer this box as a birthday gift bearing the initials of his wife, Nina Fletcher Little. H. 42-1/2, W. 32-1/2, D. 22-3/4 in. “[W]e want a good plain substantial Shaker article, yea one that bears credit to our profession and tells who and what we are, true and honest before all the world, without hypocrisy or false covering.” These words, written by Haskins in his “Reflections” of 1887, articulate the aesthetic principles that exemplify the best Shaker furniture. Haskins was born in Savoy, Massachusetts, in 1815 and was only five years old when his family joined the Shakers. By the time he was eighteen, Haskins was making furniture at New Lebanon, New York. His talent propelled him to the head of the joiner shop by 1855, when he turned forty. 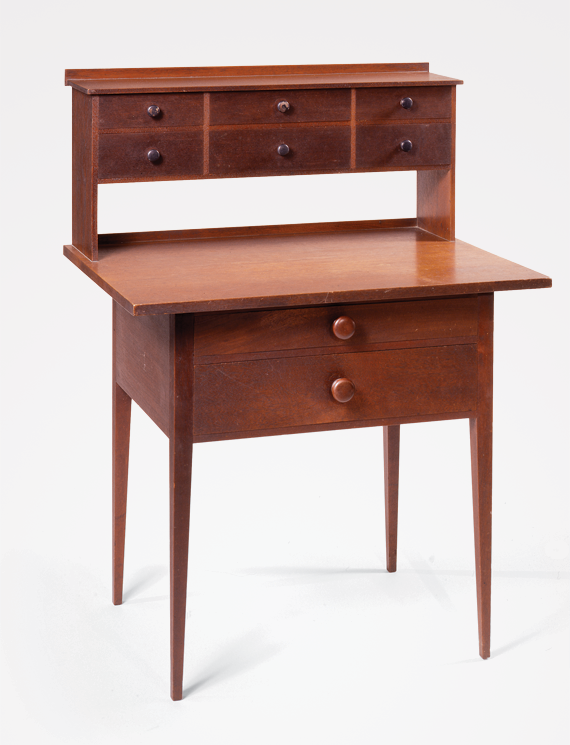 This sister’s desk is one of his acknowledged masterpieces, similar in design and construction to two signed examples in the collection of Hancock Shaker Village in Pittsfield, Massachusetts. Sisters’ desks, designed for Shaker women to use for sewing and knitting, took a variety of forms. This example stands out by virtue of its simplicity and the elegance of its horizontal and vertical surfaces. All of the artworks in Inspired Traditions illustrate the pursuit of beauty by self-taught artists. But even these individuals, working with the knowledge, skills, and cultural inheritance available to them, realized that artistry could be achieved in a variety of ways. In most of these works we see how folk artists each developed a unique set of skills, whether in craftsmanship, color, detail, or patterning, to enrich their daily lives. The result is a variegated presentation of useful and beautiful objects that range from simple, elegant forms to works of awe-inspiring intricacy. Collections such as this remind us that our artistic heritage draws from the wellspring of daily life, and that the connection of these beautiful objects to the lives and times of those who made and used them offers a rich and comprehensive accounting of a people. Inspired Traditions: Selections from the Jane Katcher Collection of Americana will be on view at the Fenimore Art Museum, Cooperstown, New York, October 1 through December 31. The Fenimore Art Museum’s 2011 Americana Symposium, September 30 and October 1, coincides with the opening of the exhibition and the publication of Expressions of Innocence and Eloquence: Selections from the Jane Katcher Collection of Americana, Vol. II (Published by Marquand Books and distributed by Yale University Press). For more information visit www.fenimoreartmuseum.org or call 607.547.1400. Paul S. D’Ambrosio is President and CEO of the Fenimore Art Museum and The Farmers’ Museum in Cooperstown, N.Y.
1. An article on the collection, written by Ruth Wolfe, appeared in our Autumn/Winter 2006 issue, vol. VII, issue 3, 92-98.